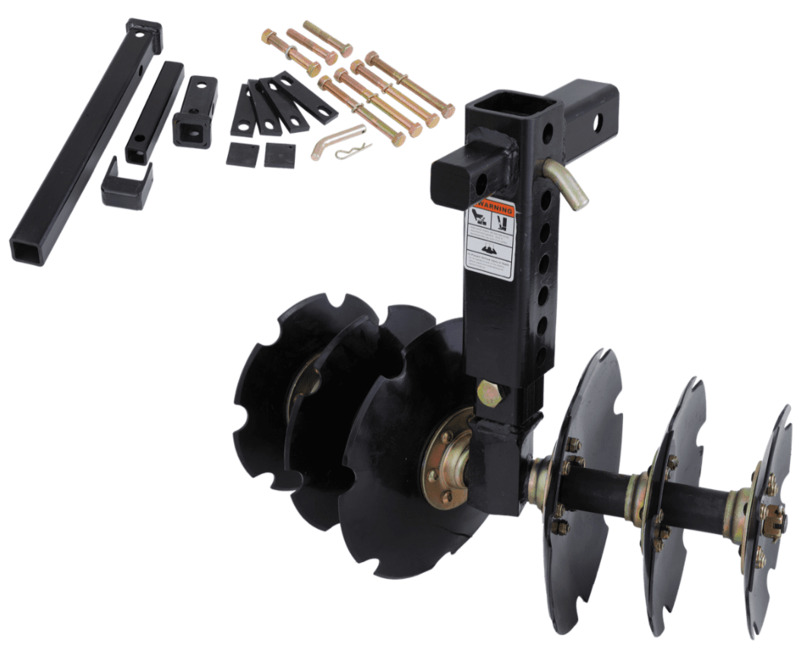 NOTE: THIS IS A UNIVERSAL DISC PLOW THAT IS DESIGNED TO FIT MOST UTV'S AND ATV'S. HOWEVER, THERE ARE A SELECT FEW MODELS THAT MAY REQUIRE MODIFICATIONS TO BE MADE TO THE RECEIVER. REFER TO OWNER'S MANUAL FOR RECEIVER SPECIFICATIONS TO ENSURE PROPER USE OF PLOW. Your UTV is a really fun machine to play in but most people don't think about how fun it can be to work in. To make work more fun or even to get to more remote areas, your side by side can be a very valuable asset and if you're looking for more UTV accessories to make your jobs around the house easier, we have just the thing for you. The Bad Dawg GroundHog Max. The GroundHog Max can be used for large variety of jobs, some you may not even think about until you have it! 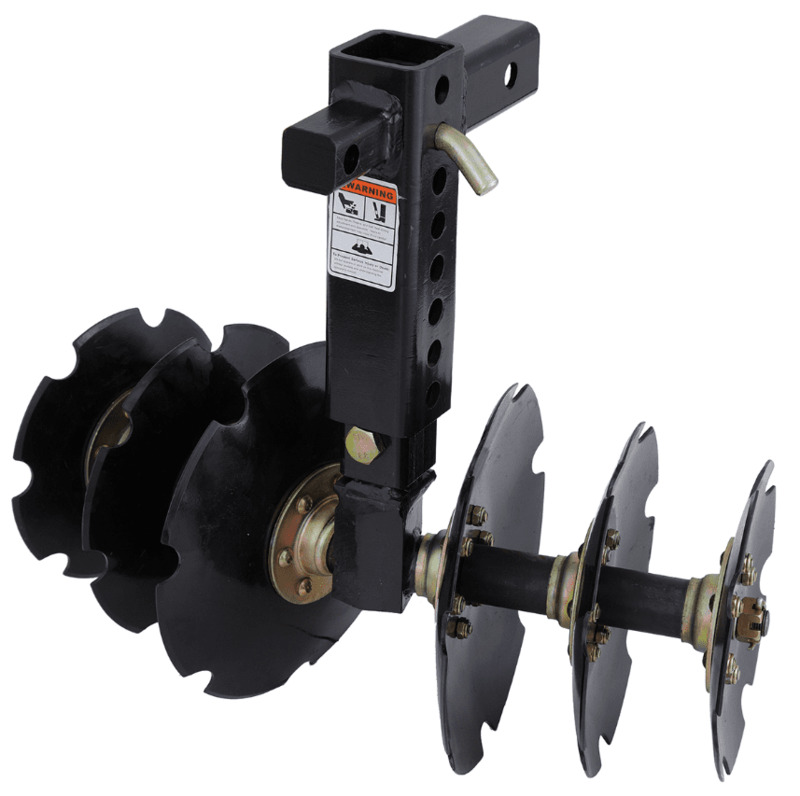 The GroundHog Max makes preparing a food plot a one person job without the demands that a tiller can place on you and is half as wide as a normal plow, allowing you to prepare ground in small, tight areas. In some states, land owners are required to have firebreaks on their property and the GroundHog Max is a great way to make these quickly and easily. The GroundHog Max is also great for landscaping, weed control, ground preparation, and the list goes on and on! The GroundHog Max plow weighs 43 pounds and comes fully assembled so you can get to work right away. One of the best features of the GroundHog Max? You can plow from 3-7 miles per hour and can even plow in reverse. The GroundHog Max even has an easy to use "transport mode" that allows you to get into even the most remote areas. Get the Receiver Kit if you don't have a 2 inch receiver on your side by side and you'll soon be finishing all those chores easier than ever. Great service and fast delivery. Can't wait to try this bad boy out! Thank you side by side stuff for your excellent service! It works just as described. It is built well. Great tool for food plots. I have it attached to a Ranger 900 XP and used it this past weekend for a small 1 acre plot. I only spent about 20 minutes and it did quite well. I will have to do another session. For the money this can't be beat, wish I had a large tractor and disk blades but it's not cost efficient for me for the food plots I want.. I do recommend this product. AS others have said make sure your hitch mount is tough enough for the added pressure. Works great on my Arctic Cat 700. It did exactly what it was supposed to do! I attempted to use this on rich soils, a couple days after rain. All it did was quickly clog-up with the short grass and soil it was cutting (cleared with a DR Brush Mower a week prior). Once clogged the disks could not spin, and just dragged behind my ATV. Ineffective at turning the soil as shown in videos. This might be useful for someone with cleared, previously plowed field in a very dry area but that is not how it is sold. The concept of taking it into tall grass and producing a food plot in an hour is a fantasy that this tool cannot produce. Thank you to the Side By Side Stuff team for working through shipping with me and going the extra mile to make sure I got what I needed in time! Tabatha, you are awesome! Awesome product! I installed it on my 2015 Rancher and I had two fields plowed to powder in no time. Make sure you read the instructions completely and install it on a very tough hitch. Do not plow too aggressive at first. Take your time and slowly lower the unit until you have the desired outcome. Cant beat the price either! Bought it for deer plots but tried it out repairing bare spots in yard. Works great! I have been looking at this disc for at least two years, read about them watched/read the reviews. My hesitation on buying one was that where I hunt has dirt but also a lot of hand size and larger rocks. Some of these rocks you can see and avoid but most are flat on the ground or just under the surface. I just wan't convinced that any unit would hold up to that kind of use. This is one tough disc! I broke up a fairly large area after a good rain and the disc worked just fine. Getting the unit back to the plot area was the main deciding factor in my purchase. If you can't get it back there then none of them work. Excellent service. There were no mounting instructions in box, but that isn't your fault. Product works great! Works great. Tall grass from last year in less than 15 minutes was ready to plant food plot. Well worth the money and no hassle traveling through the woods. Just need ramps to back on and your ready to go. This product works awesome and the value for the price is too!!! I used the groundhog max to create a 1/2 acre food plot in the middle of my timber. I have always wanted a food plot at this site but couldn't because I didn't have tractor access. With the max I just hooked it up and drove to the site with my Quad and was easily able to plow the ground and plant a fall/winter food plot with ease. I would recommend this to anyone who is trying to get a food plot in a remote area. A great product that works excellent. Everything was shipped and delivered on time and as expected. The price was 50 dollars less than the big box stores. Great little disc. Gets the job done in no time. Good price, fast delivery, and free shipping. fit well. the only issue I have is build up off sod between the discs, I made a bolt on bar with fingers to clear the build up but haven't had a chance to try it out. I need to get back to my food plot area and try it again. Once it gets through the sod it seems to work quite well. The conditions were wet when I tried it, it is dryer now so it may be very good. I will be using this in rocky soil and was very concerned if it would work so I read these reviews watched and listened to a lot of videos.I used it as you are instructed to do and that is to start at a shallow depth and work it in increments it will do the job very well.I was very interested in this because I would be working in very tight Quarters and the ability to be able to back up to turn around was a must and it worked great.I was disking a trail about six feet wide winding through trees about hundred and fifty feet long.I do have some other trails to do also.have looked at this for last three years,wished I had'nt waited so long.money well spent.I am using a polaris ranger side by side factory hitch with no problems. I researched several different discs for for my ATV before choosing this one as it had the best reviews. It basically will not work on my plot of land. The overgrown field has not been planted in probably 20 years. I first brush hogged the field as short as possible them put herbicide to kill all the vegetation. After everything has been killed off, I have tried to disc. Several passes over same area with various depth settings appears to do nothing. This would probably work for areas that have recently been worked but fails for new plots in my opinion. The adapter kit did not work with my Yamaha Big Bear. First attempt bent my hitch. I then custom made a plate and had it welded on - this one is solid. This thing really works! Corn stalks, sorghum, sod, anything I've encountered so far hasn't been much of a challenge. You can't go wrong! I owned a Groundhog for many years and no matter what kind of punishment I put it through, I just couldn't stop it. It was working great until last year when I was moving from one hunt club to a new one and someone stole it, with the receiver hitch still attached to my ATV, I hope it works as well for them as it did for me. When I ordered my new one I was able to purchase it with out the receiver hitch which made the price about $100 less then any place else I could find it, Thanks Side X Side Stuff. I haven't used my new one yet, but I am sure it will give the same unstoppable performance as my old did. I would and have recommend everyone I know to purchase one if they want to put in food plots in places where a tractor and disk can't get into. I will start using my new Groundhog to put in 4 food plots as soon as South Carolina Turkey Season ends on the 5th of May, I can't wait to have more fun again making doughnuts and running into underground stumps, which almost throws you off at the sudden stop, but doesn't harm the Groundhog on my ATV with my Groundhog attached!!! Thanks Side X Side Stuff for providing this low cost excellent product. The disc works very well. I did bend my hitch on my quad and would recommend addtl bracing. I would also make sure there are no stumps or big rocks in the area you are using the disc. If you want to turn up food plots, but can't justify a tractor; get the Groundhog Max. Works great. Turned up 3 new and 1 old food plot with it. Was able to get a 1/2 acre done in about an hour. If I could submit pics with the review, I would. I recently used the Ground hog for the first time. I was pretty happy with how it worked, but the tow insert bar was about 1/8 inch too short. I was not able to insert the pin into the hole of the trailer hitch. I have a Kawasaki Mule Pro-FXT, which has a standard 2x2 inch square insert tow receiver. The groundhog insert bar was too short to be properly secured by the pin provided with the equipment. I am looking for an alternative way to secure it. I temporary used a thin bolt I had on hand to secure it, but this is not a long term solution, it was damaged by the end of the day of use. Awesome product. Great pricing. All as promised. Friend loaned his Bad Dog Groundhog Max Disc Plow to me. It tore up hard ground on the back of my Polaris sxs at my hunting land. First time this ground was touched in years. That performance motivated me to buy my own. Excellent product at a good price and it works. Plow works flawlessly. Just wish they made a hitch kit for a Suzuki Vinson. Works extremely well. Able to break hard dirt. Does require 4WD ATV. Invaluable for preparing soil for seeding. Works fast at breaking soil before tilling a garden. Easy to attach with ramps to raise ATV. Did 4 plots in one day, works great! Works good, didn't cut tall grass as well as I expected. Worked as advertised. Tremendous asset. Put down brassica here in NH and sprouts were an inch tall in 2 weeks. The plow worked on my Polaris better than I expected. I watched all of the videos, and called their tech support and asked a few questions before I bought it. I take an old 4 x 4 block that spans the 2 rear tires to back up on to adjust the plow depth. I leave the 4x4 at the plot. I was told that hitches can bend if you use too much of the machine's weight and plow too aggressively. I start out about 2 inches and work deeper as the ground gets broken up. Watch putting the plow on backwards too. I did that the first time I used it. Great product! I've tried a number of ways to prep food plots. The Max is the best. We had to do some modification to get it to fit my wheeler. Once it was on we just kept plowing. We have a mix of gravel and rock. Really hard on a tiller. The Max never had a problem. I made four inch ramps to raise the wheeler. Set the Max at ground level and took off. It was great. I would buy it again in a heart beat. Bad Dawg Groundhog Max Disc Plow really does work. Excellent product! Works flawlessly. Very rugged. 4wd ATV a must. Even though this is a small disc, it really tears through the top soil.